What is important is how well we love. God will make our love fruitful whether we see that fruitfulness or not. Why not go out on a limb? That is where the fruit is! A view from our compound pool in late May. I aspire to eat one of these dates at the end of the summer. Ha! Today I happened to glance up at a bunch of growing dates in a tree. The small green sprigs hung like nests in a few large clumps dangling from the upper branches. In the harsh, sweltering heat of the Middle East--during the hottest summer months--fruit actually grows on trees. The sweetest manna of fruit, the date, ironically grows as if in a burning fire here. One would rightly assume nothing could grow in such abundance in this blistering air. 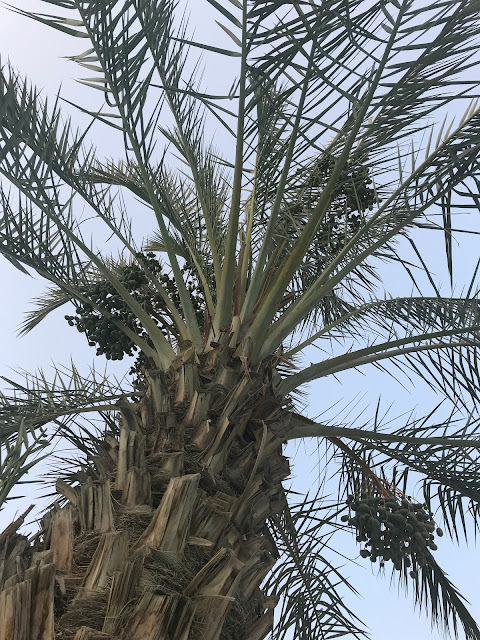 Nonetheless, the date palm trees flourish with a harvest in late August/early September. The sweet and luscious dates plop to the ground in all their splendor. Often there is not much water that nourishes them in this Middle East furnace. Yet, these date trees magnificently produce one of the main staples of the region--the delicious and healthy date. As I looked up and saw the verdant olive-like fruit above me in the date palm tree, I could not help but think that even in the heat of affliction, there is always hope. Maybe the fruit requires a long season to ripen or bear. But the objective and lesson of life are: we plow with hope, sometimes when we feel or only see scarcity around us. When the good ground seems spare or cracked, we still believe the rain will come--even in the stifling heat. We work, cheer, encourage, and wait--knowing the promise of fruitfulness is there buried in the roots. The bumper crop will come. And we will be astonished at the arm-loads of abundant fruit that we will carry from the harvest. Trees cover the ground after the Christmas season in Malaga, Spain. There is such an abundance that pruners must come in and cut some of the branches for fear the branches will break off with all the explosion of fruit. Joseph and our friend, Mitch, near an old olive press in Provence, France near Voix. Olive orchards abound in Provence, France--waiting for the harvest in Decmeber. At a market in Tangier, Morocco--the place where tangerines were named after. I have never tasted better citrus in my life than in Tangier and Spain--and I am from California. I think I ate three-five a day while in these countries. 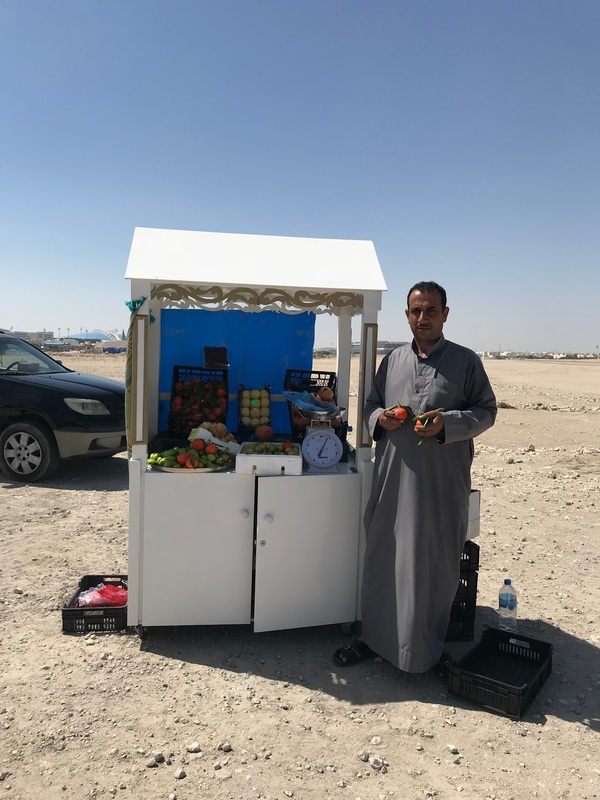 A Syrian man who I support at his fruit stand. Although his variety is not abundant, the fruit he sells is alway sweet and delicious. Lesson: There is never a meager offering. In the paradigm of scarcity and fruitfulness, fruitfulness will reign every time. Occasionally there are landmark dates when we have been separated from death with our loved ones. When a loved one has been gone one year, we square our shoulders and say we have survived one year, four seasons, without them. The years inevitably pass, but our memories linger of their laughter, hugs, and conversation. We can almost hear their voices call out--begging us not to forget them. These are moments when we tightly knit together those stories so the memories will never unravel in our hearts. Sometimes, and often on those anniversaries of death, we allow ourselves to think upon their cherished faces and what they mean to us. Today is one of those days for me. A year ago today I received a call in the Paris Airport from my sister that my father had passed away. I was jolted, almost soul-broken. I did not make it see him in his last failing moments. On the endlessly long plane ride across the Atlantic Ocean to unite with family, I shamelessly sobbed in front of a few strangers. I remember the Vietnamese passenger next to me who saw some tears. She kindly listened to a few stories about my dad I had in my reservoir to tell. Interestingly enough, as the plane landed, a sweet peace came to me: I remembered that I had spent the previous summer at my parent's home laid up with a broken ankle for almost two months. There had not only been hours and days of conversation. But we had tediously edited and read the memoirs of his life that he had so painstakingly written. With his last breath, there would still be stories, instruction, and laughter he had penned. His voice had not vanished in the air. I had pleaded for him to write his life story for years. For a long time, he demurred my questions--waving off any sign of commitment. To write about his childhood during the Depression with a dysfunctional family was too difficult for him to excavate. He did not want to dig up the old pain. However, in the five or so last years of his life, he spent an uncommon amount of time in his study writing longhand on his yellow tablets of paper. He never touched a computer--preferring to write in his almost indecipherable handwriting. Dad told us that writing down his story healed his heart. In the last month, before he died, he revealed to my mom, "I am ready to meet my dad now. I know it all will be different now." With the deep burrowing of memories, he had surprised himself with some happy moments of his father. He was ready for a reunion. So much pain had been unleashed by the simple act of writing down his life. Dad was more productive than we would all have ever imagined. There will be three volumes of his writing, and this summer I hope to finish all the editing. 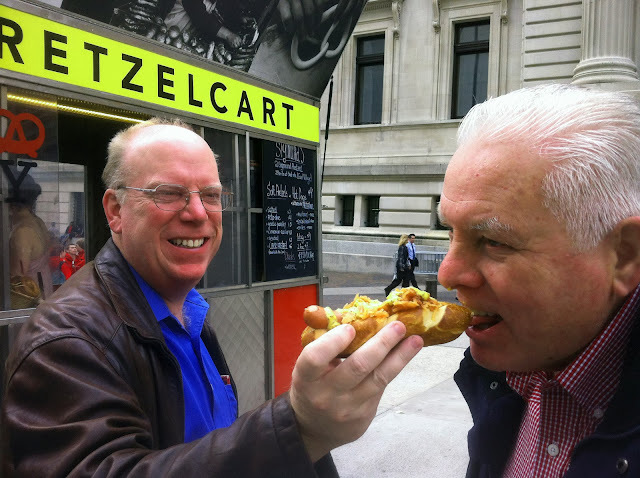 The past months have been gifts of hearing new stories, quotes, talks, ideas, and lessons from my father in his famously almost undecodable writing. He wrote away the scars and wounds and discovered mountains of blessings that he had long since forgotten. Old friends and even conversations with strangers appeared to his memory that had given him pivotal influence. It seemed that he was forming a picture in his mind with a dot-to-dot game. Chapter after chapter all the fog and confusion came together. It all made sense--even the challenges. Healing came to his wings. In front of the Met in NYC. Here are the first few paragraphs of his autobiography from his youth. Perhaps it will spark you to write your stories that need to be excavated. Or maybe you will beg a few loved ones to write theirs. Thanks, Dad. Your voice will always be loud and crystal clear. "I promise that I’ll keep trying to learn from all these experiences and be better for them. I have called my life history an interesting one. We all have interesting lives. We were not sent down to a dull planet. It may be ordinary in its size compared to many worlds in the cosmos, but it is filled with fascination. Get a paper and pencil, put down your thoughts, begin to write, and the mental pictures will come rushing in. Go to any city and look up any name and you will see the name of an interesting person. Recall, ponder, select, seek, and record your life. See in your mind’s eye the people, places, experiences, folly, success, happiness, loneliness, and the hammering of life shaping you. President Kimball said, “Write history, and perhaps the angels will quote from it.” Listen to stories because if a person thinks enough of you and what happened to them, it is in all probability an experience you can learn from. We know that the great ones on the other side of the veil desire our completeness and success. Emerson said, “Former great men and women call to us affectionately.” We have so much good in our bloodline that I feel the strong who have desired our success will help us in a transfiguring way. I find myself thinking that we stand on the shoulders of giants. Here and now isn’t all there is. You are living an eternal life, but sometimes the sum doesn’t seem like it will fit the whole. Write down your experiences so others may learn from them. As C.S. Lewis said, “There are really no ordinary people.” When we all cross the river and go to the other side, we will be happy we had all the experiences we had and the connections we found. Endure to the end, make good choices, and you will have an interesting and fulfilling life." Dad could never get enough of his grandkids. 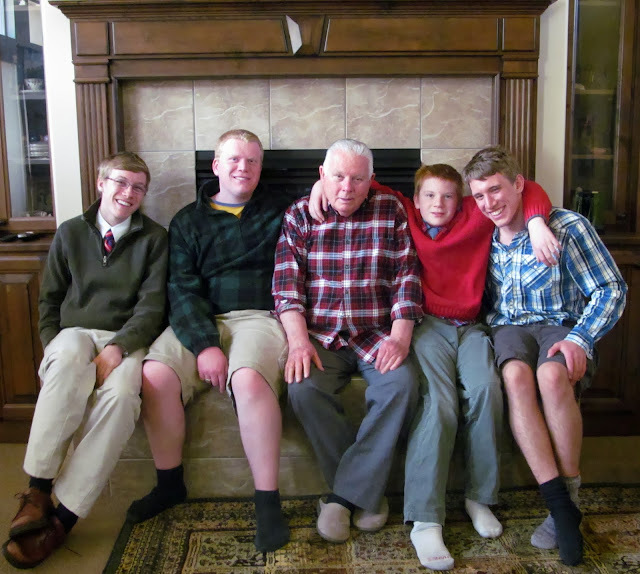 Here he is with my four sons, but he had 54 grandkids who he loved to joke with and mentor. His family and people were his greatest hobbies. 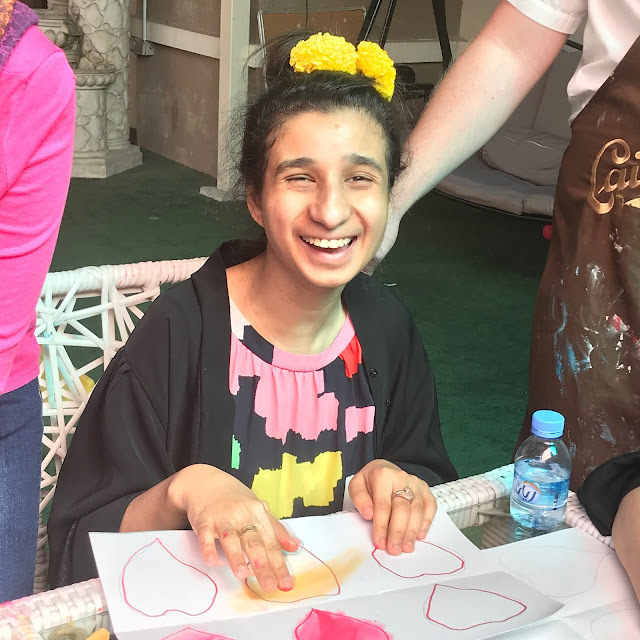 Qatar: Teaching art to kids with disabilities and seeing a new "soul-sense"
I love this "soul-sense" of joy that I get to see when these kids create. Painting with q-tips for a change of territory. I love her newly-found focus. 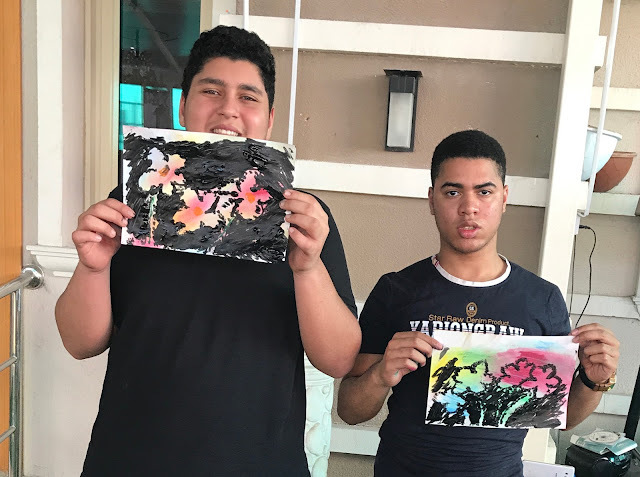 Since I have a teenage son with autism who loves art, I decided to create an experiment: having a child with a disability (my son) teach others art who have a disability this school year. 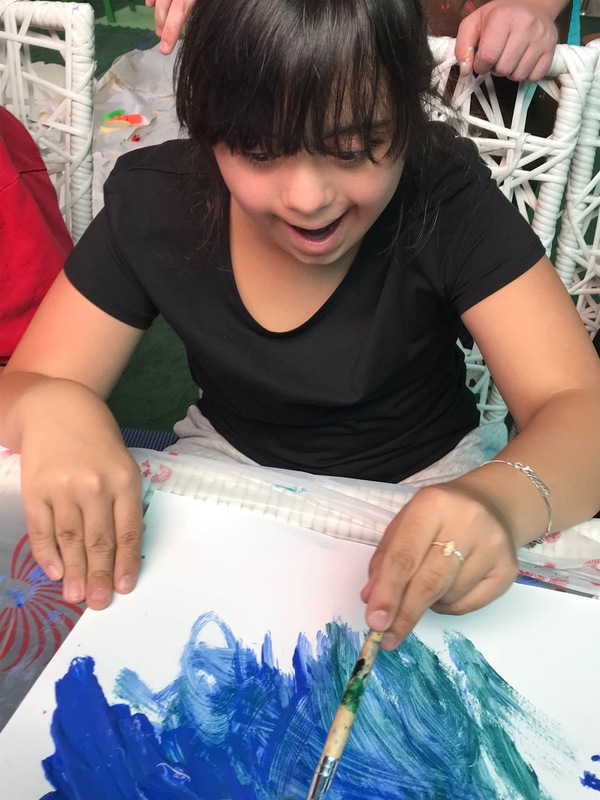 Every Wednesday morning we load up our bags of art supplies and head out to a school for disabilities here in Doha. Perhaps it has been one of the best experiments (or should I say "discoveries") of my life. For a full school year, I have seen children, teenagers, and young adults brim with joy as they create. Behavior, focus, confidence, and awareness of the world have increased. As my son, Elias has exclaimed, "Everyone is a lot calmer now from the beginning of the year, Mom." 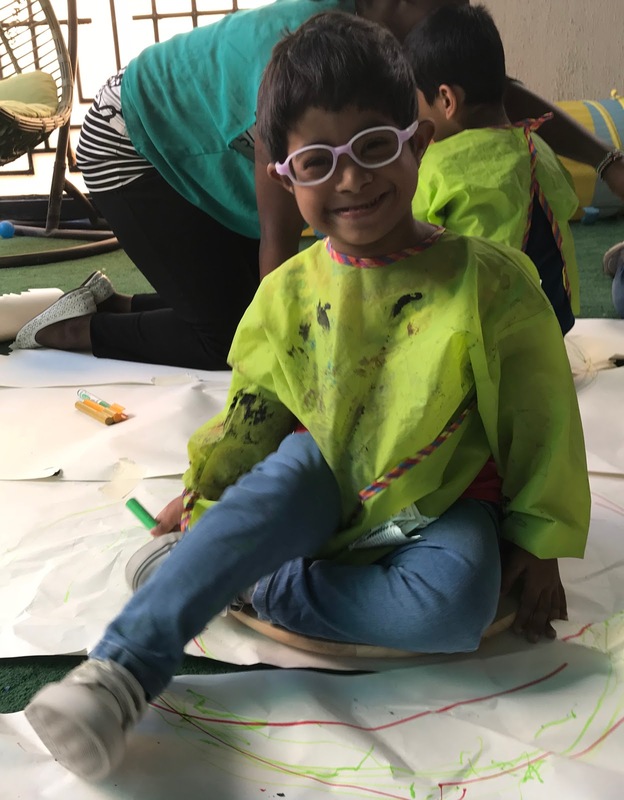 To watch children with disabilities develop and see their "soul-sense" has lifted and changed me. 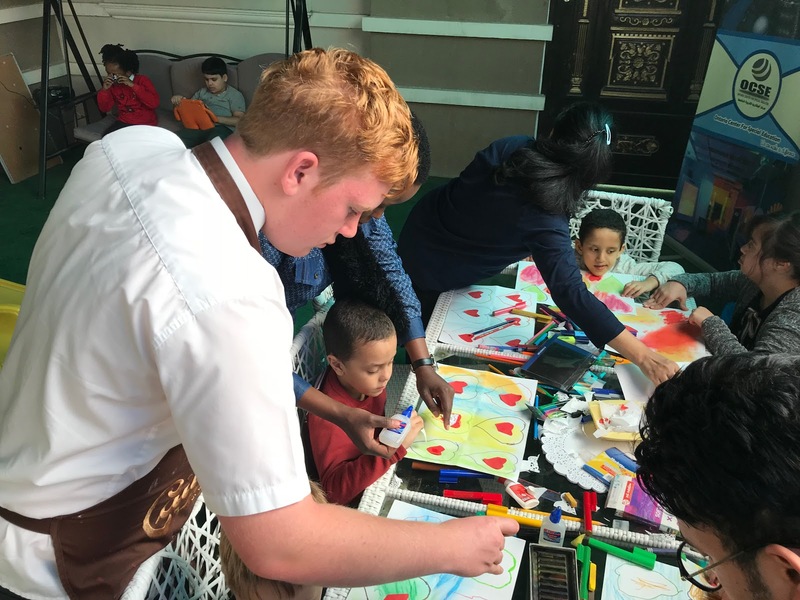 Some of them at the beginning would not touch a brush, pencil, or paint. They adamantly refused. But gently we modeled for them that twirling different colors of paint and mixing them together brought wonder. And better yet, to dab and press paint over paper is to excavate new joy. 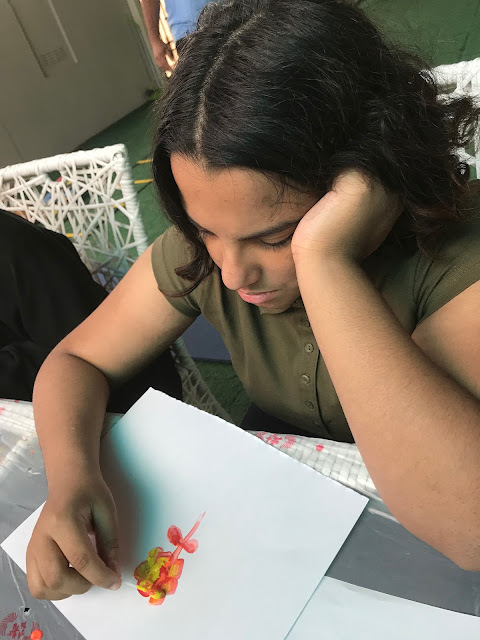 To watch children and teenagers who showed no expression before become responsive by a simple art project has shown me how much the human spirit needs to create. We all have more "soul-sense" to explore and discover. 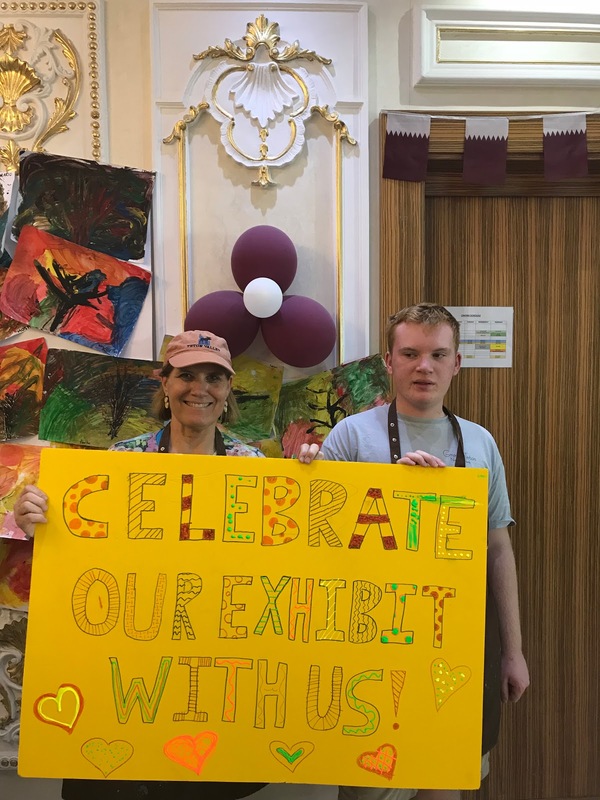 At the end of March, we (with some other typical teenagers) put together an exhibit of the work that our students had been working on all year long. Everyone marveled at their intricate compositions. They were beautifully composed and bring a lasting joy to look at them. But more than anything I will tuck in my pocket the joy of watching our students' faces this year. To see their change of expressions and emotions bring me back again and again to the art table. As the months have gone by this school year, I have seen not only faces change, but people permanently transform. We the teachers have changed. Parents now walk in to peek at their child's work with joy. Even a bus driver to our students eagerly wants to see the work of his passengers. 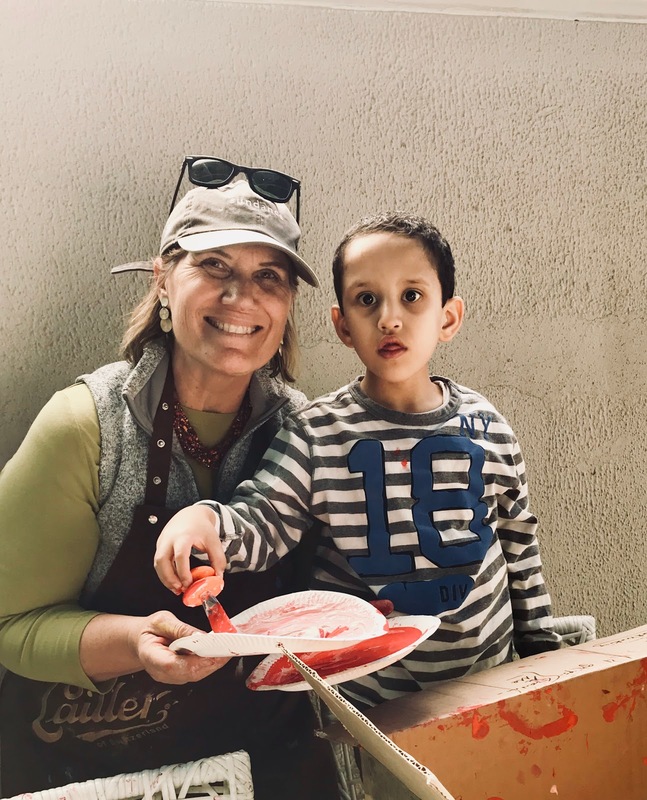 As Dieter Uchdorf has said, "One of the deepest desires of the human soul is to create." 1) Using many different kinds of techniques aides their curiosity. 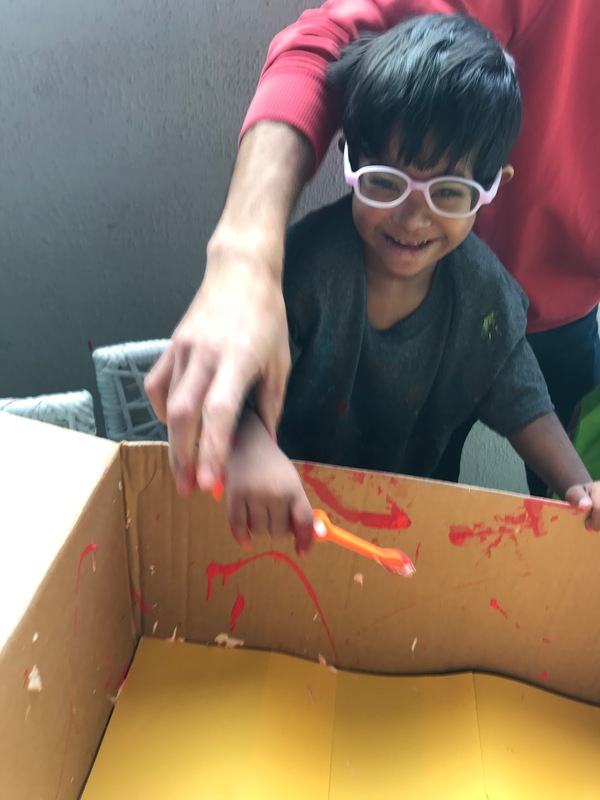 For example, painting with sponges, printmaking with leaves or fruit, q-tips, water balloons (that are partially filled), and trying the Jackson Pollack version of splashing paint inside a cardboard box. These are just a few I have used this year. The students relish the variety and diversity of the materials. 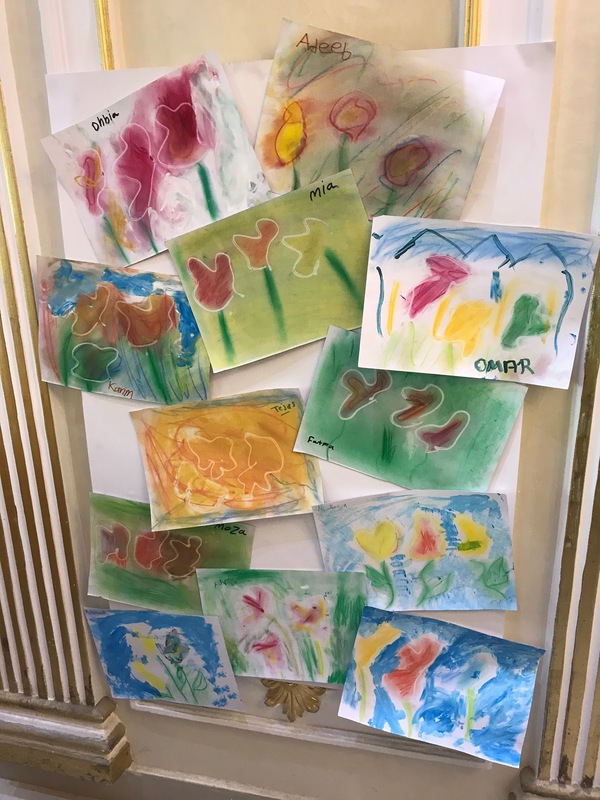 2) Bring movement to the art projects. Having the child sit on a lazy susan and spin around with a marker in their hands. If they are encircling a marker around them, making a circle, all of a sudden, the shape of a circle is more understood. 3) If you are teaching kids that speak a different language, learn some words from their language to encourage and praise them. When I speak some Arabic words, the students' eyes sparkle with more recognition. 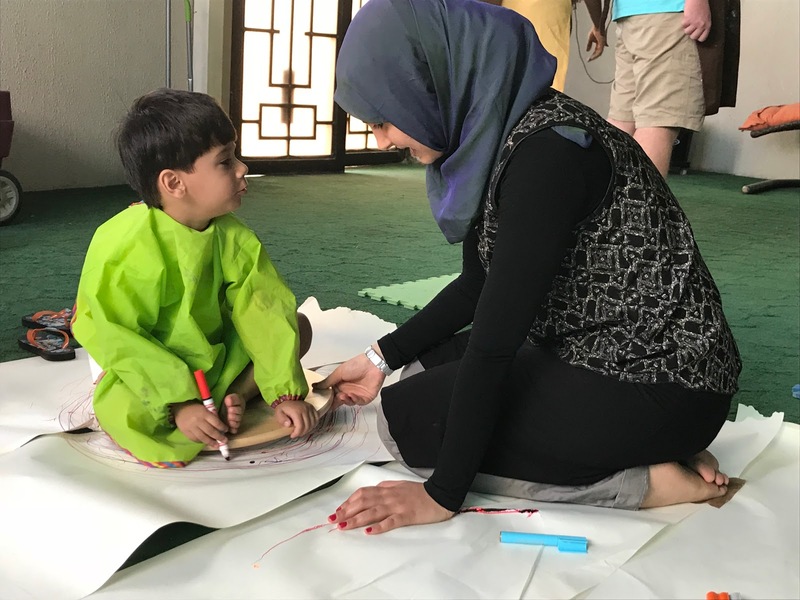 4) Talk to the parents and encourage them to do art projects with them at home. So much progress and bonding can happen at home. 5) I promise as you watch others wonder and awe, your own heart and soul will open too. Watching the awe and wonder--one of my favorite observations.